Strawberries have an ugly side. You'll recognize the one when you flip open a box to inspect a gray furry berry nestled among the bursting red ones. The clock is ticking on that box of berries. Use or lose the rest. Preserving you strawberries is an excellent option for stopping the clock on Spring's freshest strawberries. 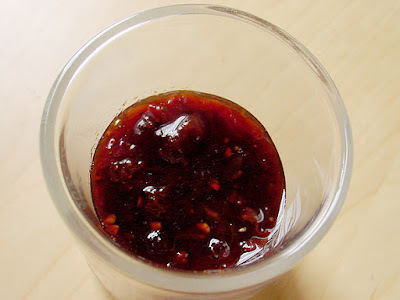 A little jar of strawberry pepper jam is a sweet, savory, creeping towards spicy way to add a dab of strawberries on cracker, toast, muffins, peanut or almond butter, cheeses or top pork, chicken for a few extra months. Place strawberries, vinegar, salt, pepper, and sugar in a saucepan over medium high heat. Bring to a boil, and reduce to a simmer. After 5 minutes break up berries with a potato masher or fork. April is raining strawberries. Florida had some bad luck earlier in the year, delaying the normal strawberry season. Now it's annual harvest is overlapping with California's and a rash of fresh bright red berries is reddening up the aisles of grocers across America. I'm toiling all this week to find a cure strawberry fever. 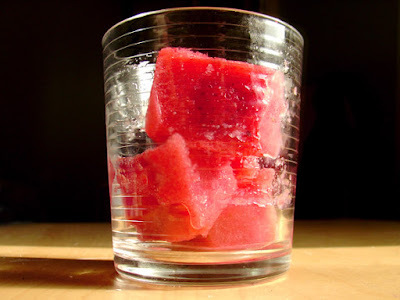 First up, cool strawberry ice cubes. Drop one or two into a glass of lemonade and watch it melt into strawberry heaven. The cubes can be stored in freezer bags for 1-2 months, so you can keep that strawberry feeling strong. Set aside 2 big berries. Toss all the ingredients in a bowl and let sit for one hour. The sugar and juice will macerate the berries, making them softer and easier to puree. My kitchen has an calendar of its own. 2 seasons, oven off (hot outside) and oven on (cold outside). We are entering the oven off season as the fresh greens and veggies poke out of the ground and find their way to my kitchen. I won't be cooking them, but I would love to layer them with homemade condiments, pickles, marinade, dressings, and other goods. 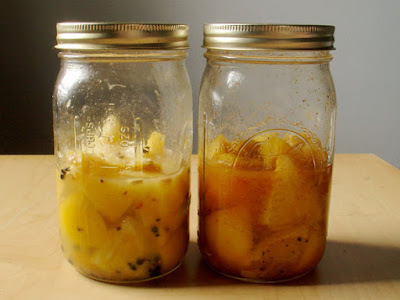 Pickled lemons are the new phenomenon around here, and I've been salivating over them since I spotted them on Tigress in a Pickle's blog. Salty, lemony, punchy, bright, and spicy acid flavors with an exclamation point. You can use them anywhere you would use salt, or every darn place. Bananas and chocolate are two powerhouse flavors made shrunk into one cute little guy iced with a harmony of peanut butter and sugar. 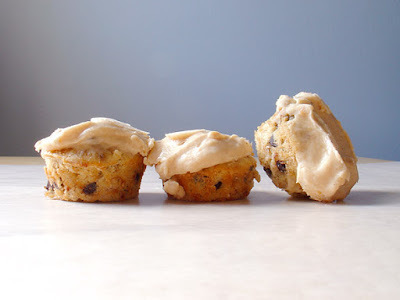 Dessert with the frosting, and fine muffin without. Top with candied bacon for an Elvis style mini cupcake. Inspired by my pal Nicole's terrific baking! Ginger so much to offer and asks for so little. 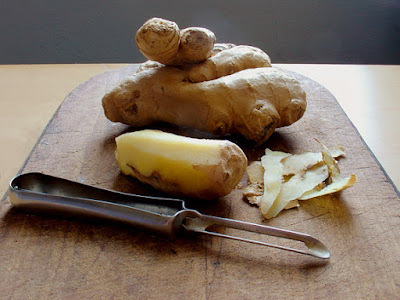 Peel, slice, chop or scratch your way down to ginger's aromatic flesh. Ginger has been used to treat nausea, motion sickness, and indigestion around the globe. Mixed reviews claim that ginger can treat inflammatory conditions such as arthritis and may prevent heart disease. The knobby tuber of the Zingiber plant pairs up with spicy flavors (garlic, chilies, coriander, cumin, basil) savory (pork, chicken, seafood, legumes, onion, vegetables, basically everything) and sweet (cookies & cake, pear, pineapple, plums, and other fruits). It also deserves its own spot light as the major flavor. Ginger can be bought ground as a powder, in sweet crystallized cubes, or fresh. In America ginger is commonly found in its mature form with a tough skin, but dig around Asian specialty stores and you may find young ginger with edible skin. When buying ginger look for firm smooth skin, not wrinkly or dried. Avoid pieces with mold. I have 2 categories for determining whether a recipe is worth baking. 1) Its easy and contains ingredients I usually stock in my cupboard. I will bake this to please myself or in a pinch for guests. 2) Recipes with a few extra steps and ingredients that make the dish a singing show stopper. Category 2 are what reputations are made out of. 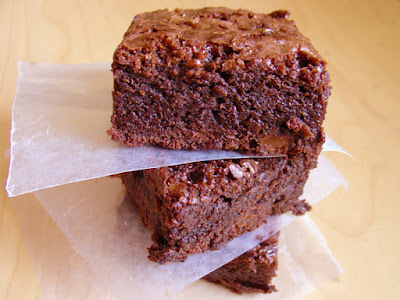 After hundreds of brownie recipes I've baked this one may be my favorite crowd pleaser category 2 recipe. Rich, flavorful, decadent, the right amount of fudgey, and soft not dense. 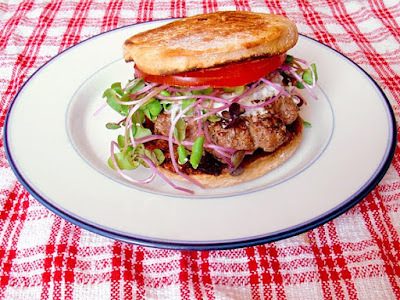 Hey hamburger move over, make some space for the lambburger. Lamb seems to be the trend food of the season, bumping pork belly and short ribs off menus nation-wide. Racks, legs, chops are all full on ways to savor lamb's assertive meat flavors. Not mouthwatering options for the non-lamb loving crowds. Enter the approachablelambburger. So juicy and flavorful it deserves its own minty condiment. Mix the first ingredients in a small bowl to make the cucumber mint sauce. Chill. Can be made 2 days in advance. This week New York Time's writes about the gaggles of foodies picking up their cameras before picking up their forks to share online. The article holds true! Keeping Cantaloupe Alone has thrown a kink in the way interact with food. I eat around what I plan to eat for the week balanced by what I think people will find interesting or (to quote Brian of NYDP's) blog-worthy. I know people don't want to pictures all of the baby carrots, oatmeal, trident bubble gum, bananas, apples, veggie burgers, and lentils I constantly eat. I submitted some of my blog photos. 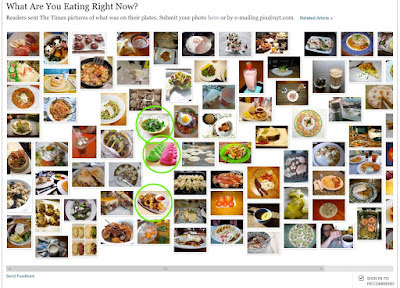 Heck yeah, the NYT posted them with a wall of other food. Enjoy grazing, and thanks as always for keeping this cantaloupe company! Spring is in sprouting everywhere. My windows are open and the oven is off. 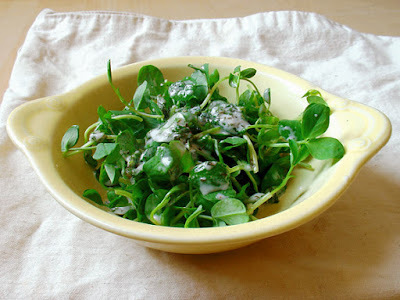 I'm calling pea shoots with buttermilk mint dressing the first real salad of the season. Pea shoots are the succulent leaves and stems of pea plants and also some of the first green produce to hit the farmer's markets. The succulent leaves and tendrils are not unlike alfalfa sprouts, but with more crunch and a touch sweeter. Place the first 7 ingredients in a jar and shake until mixed. Place pea shoots into serving bowl and lightly dress and mix the greens. Isn't it nice to make something simple and green after a long winter? Use the extra buttermilk dressing on other vegetables, or try a splash on rice dishes. Today is census day, and that's not an April Fool's joke. Take a break, make a cup of joe, and fill out your census form. Most importantly mail it back— note the free postage. Sending in your census form is like voting for your neighborhood. Be loyal to it and more city services may come to your hood. 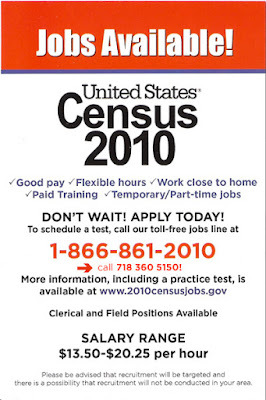 AND the census bureau is looking to employ part time employees to complete the counting process. You can help and make bucks. This message brought to you in part by social ink.